Film Review: "Missing Link" (2019). "Things Are About To Get Hairy" in Missing Link. This stop-motion animated adventure film written and directed by Chris Butler and produced by Laika. The charismatic Sir Lionel Frost considers himself to be the world's foremost investigator of myths and monsters. The trouble is none of his small-minded high-society peers seems to recognize this. Sir Lionel's last chance for acceptance by the adventuring elite rests on traveling to America's Pacific Northwest to prove the existence of a legendary creature. A living remnant of Man's primitive ancestry. The Missing Link. In late April 2018, it was announced that Laika had begun development on "Film Five," a new animated film written and directed by Butler and starring Hugh Jackman, Zoe Saldana, and Zach Galifianakis. The film was set to be produced in association with Annapurna Pictures, as Annapurna's first animated film for their "family and animation" division. 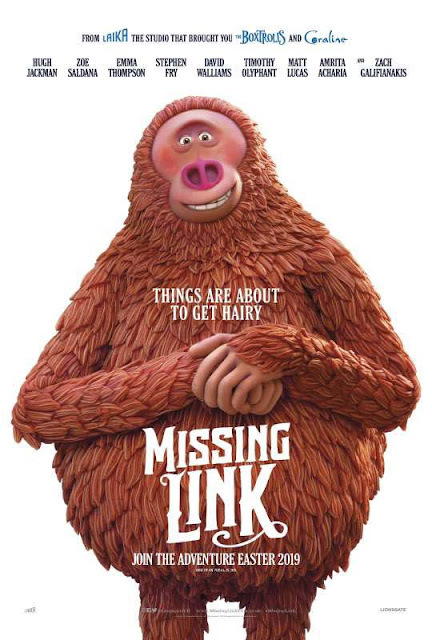 In early May, it was announced that the film had been titled Missing Link and that additional voice talents would include Stephen Fry, Emma Thompson, Timothy Olyphant, Matt Lucas, David Walliams, Ching Valdez-Aran, and Amrita Acharia. At the same time, production was reportedly underway with Laika's artists having constructed over 110 sets with 65 unique locations for the film. The film was shot in the 2.35:1 aspect ratio, the third Laika film to do so after ParaNorman (2012) and Kubo and the Two Strings (2016). The film features the voice talents of Jackman, Saldana, Thompson, Fry, Walliams, Olyphant, Lucas, Valdez-Aran, Acharia, and Galifianakis. The cast gave terrific performances. Galifianakis delivered tender performance as the innocent, gentle title character. Jackman delivered a suave performance as self-involved myths and monsters investigator. Saldana gave a feisty performance as fierce yet free-spirited and conscientious adventurer and former girlfriend of Frost. Finally, Fry made another terrific villain as the prideful, snobbish head of a society of "great men", and Sir Lionel's rival. Beautifully animated and solidly scripted, Missing Link will entertain children while providing surprisingly thoughtful fare for their parents. Few movies so taken with evolution have felt so rudely alive as this one, the latest handcrafted marvel from the stop-motion artists at Laika. It's an engaging entertainment, with a solidly constructed storyline. The film has a unique look that's equal parts old school and cutting edge. The puppetry is impressive - the human character and title character are a feast for the eyes - and the stop-motion is fluid. The thrilling finale is a terrific blend of heartfelt emotion, spectacular visuals and inventive spectacle. It often feels as if it caters more to kids than adults, but I think the entire family can enjoy this one as long as adults enjoy man's primitive ancestor in a suit goofing around for the entire show. It has its entertaining moments, but this stop-motion animated comedy-adventure cries out for more activity. Regardless of its flaws, the film is a sweet, funny take on horror films that turns many of the tropes of the genre on its head. It's very, very nice to see a stop motion film. It's just plain fun. Also, see my reviews for ParaNorman and Kubo and the Two Strings. "Give Evil Hell" with Hellboy (2019). This supernatural superhero film directed by Neil Marshall, adapted by Andrew Cosby, based on the Dark Horse Comics character of the same name. It is a reboot of the Hellboy film series, and the third live-action film in the franchise. The film sees the legendary half-demon superhero discover The Blood Queen, Nimue, a resurrected ancient sorceress thirsting to avenge a past betrayal. 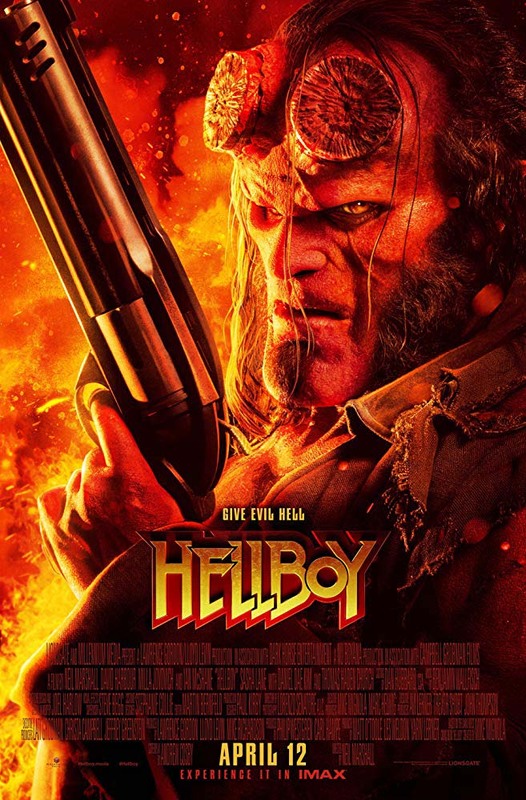 Suddenly caught in a clash between the supernatural and the human, Hellboy is now hellbent on stopping Nimue without triggering the end of the world. The project originally began as a sequel to Hellboy II: The Golden Army (2008). However, in February 2017, the project was turned into an R-rated reboot after del Toro stated that "100% the sequel will not happen." In May, Mignola announced that the reboot, then titled Hellboy: Rise of the Blood Queen, would be directed by Marshall and star David Harbour. Mignola also stated that the film would have an R rating, and that it was also targeted for a January 11, 2019 release date. According to Mignola, the idea with this one was to downplay the superhero elements in the film and stay closer to the darker tone of the graphic novels, making a much more horror-oriented entry into the franchise. By September, Milla Jovovich, Ian McShane, Sasha Lane, Daniel Dae Kim, Penelope Mitchell, Sophie Okonedo, and Thomas Haden Church had rounded out the cast. At the same time, principal photography began and wrapped in December. Filming took place in the United Kingdom and Bulgaria. The film faced a hellish production since late August 2017, when Ed Skrein was originally cast as Major Ben Daimio. However, upon discovering that Daimio was a Japanese-American character, and facing "white-washing" criticism, Skrein pulled out the role a week later. Ultimately, Kim was cast. Production troubles worsened with a series of disagreements that boiled over when the producers decided to replace Marshall's go-to cinematographer, Sam McCurdy. People involved with the production said McCurdy was fired simply because producers Lawrence Gordon and Lloyd Levin were trying to send a message to Marshall that he was not in charge. Other spats involved rehearsals, where Levin would also frequently interrupt Marshall in front of the crew as Marshall tried to rehearse actors, sometimes giving them different directions. Harbour repeatedly walked off set, refusing Marshall's requests for more takes. A prolonged dispute over a surreal tree that figures prominently in the film. Marshall wanted a realistic-looking, asymmetrical tree. But Levin overruled him, insisting on a symmetrical tree. In addition, the script was re-written throughout the production by Harbour and McShane. Finally, after Marshall handed in his cut of the film, the producers took over. The film stars Harbour in the title role, with Jovovich, McShane, Lane, Kim, Mitchell, Okonedo, and Church. The cast, with the sole exception of Harbour, gave ham-fisted performances that didn't do their characters justice. Loud, excessively gory, and often boring, Hellboy nonetheless has the charisma of David Harbour to offer mild relief. 'A Tree in Water: My Journey From Aotearoa to The Great White North' Chapter 82. I started the day with some decent breakfast. My breakfast is easy to make. First I put the toast in the toaster, and then I cook three strips of bacon, and then cook two eggs and two slices of tomato with the bacon grease. I’ve been having this kind of breakfast ever since I moved to this country. The less complicated the breakfast the better. Keep it simple. I then ventured out for the day for another photography meetup. Not something I want to miss out on. It’s a pretty interesting one today; then again, almost every meetup is. The first thing I did was to search up directions to the location. Without a less complicated method of transit, it took a little longer than expected. The trip itself took almost an hour – why?! With not a single cloud in sight, the day was sunny to the point where I had to wear my sunglasses for the entire time. And thus it was the perfect excuse to make my way inside Junction House and get with shooting the exhibition inside. But remembering, the exhibition inside wasn’t exactly cool inside since the exhibition was filled with neon lights curated by Neon Demon Studios. So the heat didn’t go away for me. Eventually, it went out of my mind as I was focusing on shooting the neon pieces. If you’re curious, the room was at a warm temperature. I did the entire room and shot every single piece, and I’m happy to report that the photos came out perfectly. The shoot at Junction House ended rather earlier than I had expected, which ultimately was no surprise. It had become rather crowded by this point. The group then gathered in the lobby and were waiting for the rest of the people to wrap up. I sat down at one of the tables waiting. Remember, I stood for the entire time since I got off the bus and needed to rest since I was done. But all things considered, it was rather boring waiting. The group were waiting and talking to each other as usual, and we were starting to get hungry at this point. The one remaining thing to do next is to find a place and grab some fuel. It was not too far from Junction House that we finally had some drinks and food before we went into full force to another meetup on the same day. But as I suspected, the location was to be somewhere far from where we were. Not only that, there weren’t a lot of cars to transport everybody to the next location. So once we had finished eating, we had to immediately reserve our spots in one of the cars. So I immediately leaped the chance and got my spot. All told, that was a bit of a scary thought. But I luckily got my spot in one of the cars. What if I hadn’t gotten my spot? I wouldn’t know what I could have done. But I was lucky. Next time I don’t know how I might turn out. I need to be ready as much as possible for these kinds of situations. At least I was in Toronto, Canada of all places, and not somewhere in the United States. Once I’m in a place like the U.S., then I can’t really count on anybody to guide and transport me around a landscape or terrain that I’m not used to. If I could have anything in these kinds of situation, if it ever came down to it, it would definitely be a smart phone, always. It’s been a long time since I’ve photographed sunsets. Just saying. Anyways, we made our way to Polson Pier and shot the sunset before it went out at 8pm and become blue hour. I didn’t take a lot of shots. Believe me, even now thinking about in retrospect, there wasn’t much to shoot. Anyway, I and others in the group wrapped after a few shots and separately made our way home. Up till now, I’ve been out with the meetup group for pretty much almost the entire day. So when I finally made it back home, I was tired and exhausted. So I can take my time editing and uploading the photos. I’ll do it tomorrow. I’m already in bed after a nice, cool shower. 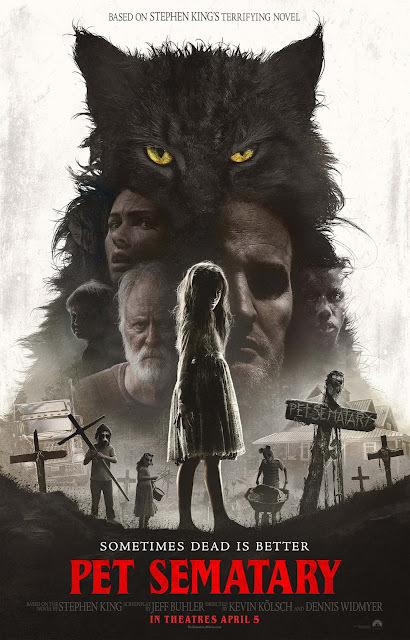 Film Review: "Pet Sematary" (2019). "Sometimes Dead Is Better" in Pet Sematary. This supernatural horror film directed by Kevin Kölsch and Dennis Widmyer, written by Jeff Buhler, based on the novel of the same name by Stephen King. The film follows Dr. Louis Creed, who, after relocating with his wife Rachel and their two young children from Boston to rural Maine, discovers a mysterious burial ground hidden deep in the woods near the family's new home. When tragedy strikes, Louis turns to his unusual neighbor, Jud Crandall, setting off a perilous chain reaction that unleashes an unfathomable evil with horrific consequences. In early March 2010, development on a new adaptation of Pet Sematary with Matt Greenberg hired to pen the screenplay, Lorenzo di Bonaventura, Mark Vahradian and Steven Schneider as producers, and Juan Carlos Fresnadillo as director. In late October 2017, Paramount Pictures had officially greenlit the new version of King's novel with Kölsch and Widmyer hired to helm the director's chair. By mid June 2018, Jason Clarke, John Lithgow, and Amy Seimetz had been cast as Louis Creed, Jud Crandall, and Rachel Creed, along with Jeté Laurence as Creed's daughter Ellie and twins Hugo and Lucas Lavoie as Creed's son Gage. At the same time, principal photography commenced and wrapped in mid August. Filming took place in Montreal, Quebec, Canada, and was shot digitally in the widescreen 2.39:1 "scope" aspect ratio. For the ending, the filmmakers had ideas for endings, multiple endings were written and shot. In the various endings, Louis Creed is served with the terrible consequences of his desperation to keep his family together at all costs, says Kölsch. They never intended for the film to have a happy ending. One of them was the original ending from the novel. King proposed an alternate ending to the filmmakers. However, King's ending was never used. Ultimately, the final ending was chosen after getting the best responses from test audiences, according to Di Bonaventura. The film stars Clarke, Seimetz, and Lithgow. The cast gave performances that brought their own unique iterations of the characters, as well as an intensity that differs from the performances given by the cast of the 1989 film. With everything to work with, the cast and crew of Pet Sematary (2019) have teamed together to destroy all that we thought we knew about author King's terrifying bestseller. There were moments that were so unexpected that only the talents behind it could pull them off, yet the film is disloyal to be the horror jolter that it was expected to be. Those expecting a faithful adaptation may be disappointed. The film is somewhat a disappointment. The biggest letdown is that it contains virtually little thrills and scares. Given the talent in front and behind the camera, one's immediate reaction is that they were after something other than thrills. If so, it's hard to figure out what. Ultimately, the film is a loose, jump-scare-filled distillation of King's bestselling novel, and looms as one of the lesser King adaptations. I can't recall a more elaborately ineffective scare movie. 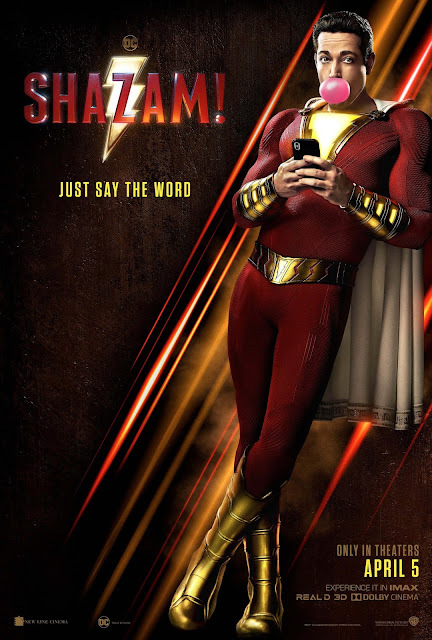 "Just say the word" Shazam! This is the word for this superhero film directed by David F. Sandberg, written by Henry Gayden, based on the DC Comics character of the same name. It is the seventh installment in the DC Extended Universe (DCEU). We all have a superhero inside us, it just takes a bit of magic to bring it out. In Billy Batson’s case, by shouting out one word - this streetwise 14-year-old foster kid can turn into the adult Super Hero Shazam, courtesy of an ancient wizard. Still a kid at heart - Shazam revels in this adult version of himself by doing what any teen would do with superpowers: have fun with them! Shazam sets out to test the limits of his abilities with the joyful recklessness of a child. But he’ll need to master these powers quickly in order to fight the deadly forces of evil controlled by Dr. Thaddeus Sivana. Since the early 2000s, development of a live-action Shazam film began ay New Line Cinema, but faced development hell for many years. Marking the first Shazam film since Adventures of Captain Marvel (1941). Various directors and writers were attached to the project at various points. In 2014, the film was officially announced with a July 2016 release date. In September, Darren Lemke was hired to pen the script. In January 2017, Henry Gayden was hired for rewrites. In February, Sandberg signed on to direct. In October, Zachary Levi was cast as the titular character after various actors were considered and had auditioned. Levi packed on 20 pounds of muscle for the role, putting his weight at 220 pounds. In November, Asher Angel was cast as Billy Batson. By late January 2018, Mark Strong, Jack Dylan Grazer, Faithe Herman, Meagan Good, Grace Fulton, Michelle Borth, Ian Chen, Ross Butler, Jovan Armand, D.J. Cotrona, Marta Milans, Cooper Andrews, and Djimon Hounsou rounded out the cast. At the same time, principal photography began and wrapped in mid May, under the working title Franklin. Filming took place in Toronto, Ontario, Canada, with most of the film shot at Pinewood Toronto Studios. The filmmakers primarily adapted elements from the New 52 origin story, as well as cited Big (1988) and Stranger Things (2016-19) as an influence on the film. The film stars Angel and Levi in the title role, with Strong, Dylan Grazer, and Hounsou. The cast gave terrifically fun performances, especially that of Levi. Who was perfectly cast in the role. He completely sells you on the idea that he is a joyful kid at heart trapped inside a ripped, godlike body. Any poor choice would have ruined the film. Shazam! deftly blends humor and gravitas, taking advantage of the perfectly cast Levi to craft a loving, fun and joyful to an underrated American superhero. The film is a pure delight, a wondrous combination of child-like adventure, heroes and villains, action and comedy. It is a wonderful, chuckling, preposterously exciting fantasy. Also, see my review for Annabelle: Creation and Aquaman. 'A Tree in Water: My Journey From Aotearoa to The Great White North' Chapter 81. When I woke up this morning, my phone rang and it was from Sporting Life regarding a job application I made a while back. They wanted to have an interview with me. So that was a good start. The phone call was kind of unexpected. I only had a day or two, at this point, until the interview. I needed to get completely prepared for this. That required me to get some stuff all ready to go. The first step was to go down the street to Queen Street to get some documents ready. Then came back up and cross the street from my place to get a haircut. Oh thank God! It was about time that I got a haircut, with the fact that it has been months since the last one. I decided this was the best time since I needed to look good for the interview, and not look like Shaggy from Scooby Doo. Basically, I just needed to have a neat, short haircut. I can make myself look good with this kind of hairdo. But if I did the interview without looking my best, I can definitely tell you that the interview would probably go down hill. So I needed to get a haircut. I needed to look the best I can for it. So I got my haircut. A haircut that only cost me ten dollars, but I nonetheless got it. I then crossed the street back to my place and then hopped into the shower, having a thorough wash. As I had hoped, the haircut went nicely and my new hairdo is neat and short. From there, it all came down to do one more thing. But before I could get to that, I was to meet up with Herwin, and it was Wings Wednesday. After two or three hours, I came back home and then I sat down for a moment. Whilst I was preparing for the interview, I was kind of dumbstruck that I finally was getting an interview with Belinda’s old workplace. And now, the day has finally come, and I’m in my suit and with my bag waiting in the Sporting Life reception area on the sixth floor. But I needed now was to be myself, answer the questions as best and as honestly as I could, and ask all the questions I wanted to ask. But for now, it’s early and I needed to wait until the managers were ready. I spent that time going over what I could say. It may not have been the things that were ultimately said, but I went over it in my head just in case. The interview could still go in any direction. I’d rather be prepared than be not prepared at all. And the time had finally come. Wish me luck. 'A Tree in Water: My Journey From Aotearoa to The Great White North' Chapter 80. I had the best day today, and I just had a ball. It started out pretty dreary. I had to sleep a little more since it was raining all night the night before. The bed won’t be as comfortable as I would like it to be every night. But I did get the bed for a cheap price, somewhat. I also can fold it up and use it as a couch. Anyways, suffice it to say, the sleep the night before was not a good one for a couple of reasons. But after an additional hour or two more of sleep, followed by a nice shower and a decent breakfast, I was feeling much better. At first, I thought about not attending the 35mm screening of David Cronenberg’s Crash with a special Q&A with Viggo Mortensen. Instead, I thought about just job hunting and doing my other usual chores. Then I changed my mind. After having a good think about it, I came to the conclusion that I’d never to be able to have this kind of opportunity. I needed to go. So today was focused on getting to TIFF Bell Lightbox and get in to see the film and Mortensen himself. I brought my emergency bag with me, just in case, figuring I needed to be prepared. And along with my usual stuff, I brought my iPhone. Once I got there, I got in the rush line and stayed there. I didn’t want to move or get out of line so that I could do anything else such as going to the bathroom. So I just stood in line and sucked it up. Good thing, too. Because if I didn’t, I wouldn’t have gotten in. I got out my headphones and just listened to music whilst I was waiting. It’s the usual thing I do in times like this. I removed my headphones and then answered a question from a person about the line, and then he jumped in after I did. Once he did, he kept talking to me until I got my ticket. I got a ticket that was refunded due to customer cancelling in the last minute, and then I made my way up to Cinema One. Then I waited for the guy to show up and we then made our way in and grabbed the best seats in the house. Now we were in the front, not too front though where my eyes could be damaged. We continued our talk until the show started. The person curating the event was none other than Cameron Bailey, the Artistic Director and the Co-Head at TIFF, who kicked things off. I only had one thing in mind when he was talking: When will Aragorn show up? I smiled when Bailey finally introduced Mortensen to the stage. Something went off in my body, and I didn’t know what that was, regardless my heart was pounding. The film finally started after Mortensen finished his introduction. It only got better afterwards, kicking things up a notch when Mortensen invited a surprise guest to the stage. It was none other than the auteur himself, David Cronenberg. I was over the moon when he entered the stage, wanting to scream but holding it back within me. I smiled like the Cheshire Cat, grinning from ear to ear, and could just barely hold my excitement. I just couldn’t sit still. That was I during the entire time Cronenberg was on stage talking. Every person has their special memories that they will never forget so long as they live. Tonight, along with meeting Hans Zimmer, Guillermo del Toro, and Shinya Tsukamoto, and even when I discovered cinema for the first time in my life when I was just five, will be memories I will never forget so long as a live and breathe cinema. Anyways, with the night over, it was time to go home. Problem is, I wanted to get a photo with the both of them. Remember, I’m a huge fan of both of them, I particular Mr. Cronenberg. In the end, I had gotten the most out of one day when I attended the screening. And this night will forever be in my memories. So the day really became one of the best days from my point of view. I just was on cloud nine by the end of it. And I just couldn’t stop thinking about it. I hate for the day to be over, but there’s nothing much I can do about that except treasure it for the rest of my life. I figured it was the only thing I could do. It’s probably true. And hey, with that in mind, I got to see Viggo Mortensen and David Cronenberg in person. It’s not something I can say everyday in life for that matter.